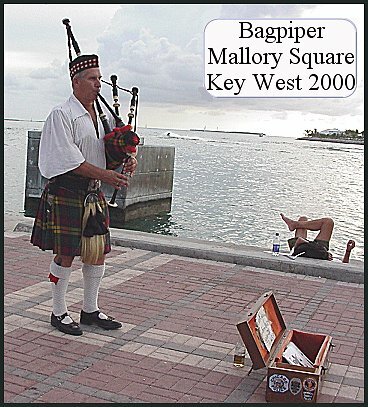 The Bagpiper of Mallory Square! Notice the laid back Key Wester at the bottom right of this picture. Every evening people gather at Mallory Square and watch the sunset. While waiting for this momentous and beautiful event, vendors sell their wares while mimes, jugglers, musicians and magicians perform! There are animal shows and human statues. There is a "Cookie Lady" on her bicycle and Rosie's favorite is the bagpiper. She says they have "grown-up" together!